It is indeed time that we begin to put people on these governing bodies who gonna represent the best interests of the people. I don't care whether you're black or white, Jew or Gentile, Protestant or Catholic. But it is time now for us to stop just putting someone on the council because they look like us. We need to put people on the Council and the County Commissioners who's going to stand up as the founding fathers of our Republic. And I mean the founding fathers of those who put themselves in the civil rights struggle on the front lines to do what is right. 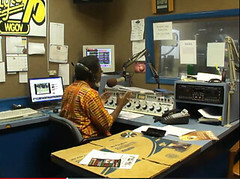 Then he said Valdosta City Councilman James Wright would be on George's radio program, and he invited all the rest of them to appear on his show, Magic 95, 950 AM. 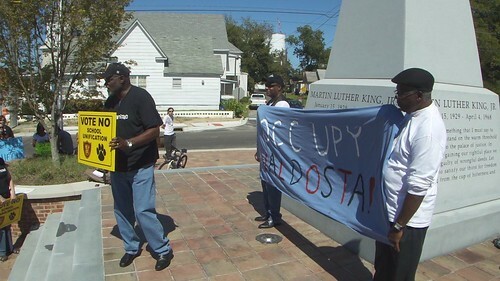 Turning radio into TV, here's LAKE video of Tuesday morning's interview with Chris Beckham about Drive Away CCA, the motorcade against the private prison. Listen for the mentions of Sheriff Chris Prine (he is opposed to the private prison "I want him in my jail, not a private jail") Winn Roberson (the motorcade was his idea), Matt Flumerfelt (he filed the open records request that revealed the contracts with the March 13th), Bobbi Anne Hancock (she dug up a history of CCA that reveals problems for many years and she had a very funny interview with VLCIA executive director Andrea Schruijer), George Boston Rhynes (he's been following incarceration and especially jail issues for many years), and former sheriff and current Lowndes County Commission Chairman Ashley Paulk (he listed a number of hurdles the prison project would have to leap before it could happen), and also the VDT. Too many other people are involved to name here. 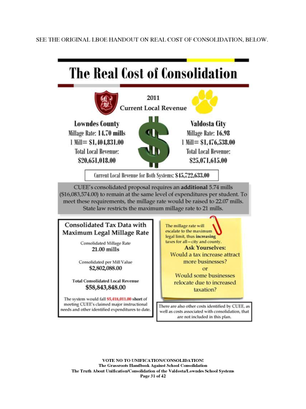 Speak at the Valdosta City Council meeting Thursday or at the Lowndes County Commission meeting next Tuesday. They're both implicated in this private prison decision. I'm sure other people can think of many other things. CCA cares about "public acceptance of the Company's services". If we show enough public opposition, we can Drive Away CCA! PURPOSE AND DIRECTION OF TODAYS PROGRAM: To keep citizens informed; help eliminate the deaf; dumb; and blind process in our beloved community. For too long local radio has failed to have open disucssion about the real issues that too often are not published and excluded from our history. This is an honest attempt to keep alive what others may not believe to be of value to us; or coming generations that will look for a real and true history of what took place today. So I hope this will be carried on by others in our beloved community for the good of all human beings. PS: Other people may call him crazy; I call him dedicated. Chris Beckham's Black Crow show, WVGA 105.9, about 4PM, will have Bobbi Anne Hancock, Jim Parker, John S. Quarterman, and Austin Batchelor Sullivan, talking about Occupy Valdosta and related matters. And everything is related.